You can take part in competitions and even win with this electric car toy, the top speed allows this. Its S-Truck suspension technology provides excellent control and stability on the surface. Rubber tires may wear off with time if you use the car on asphalt. 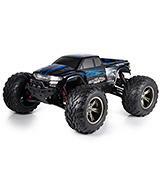 If your kid dreams about a radio-controlled vehicle to use successfully off-road, this toy car with a remote control is a perfect choice! With this reliable and fast toy car, anyone can become the king of the road. This off-road monster truck is unrivaled! 12.6" x 10.2" x 5.5"
The availability of three LMV and the option of fitting even more cars in the truck make it possible for several kids to play at the same time. Getting used to controlling small cars may take some time. 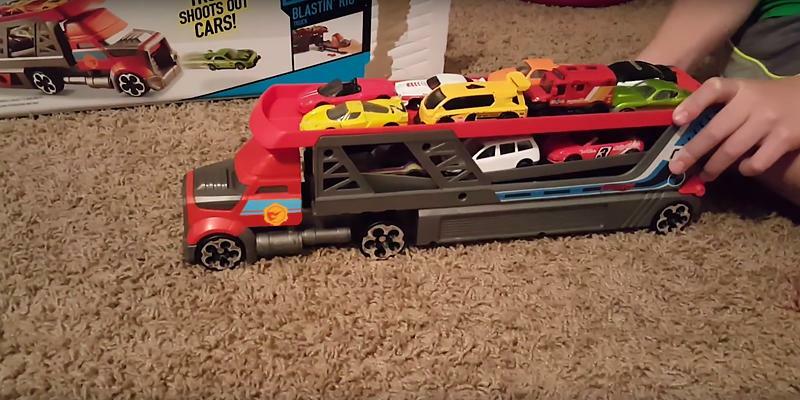 Hot Wheels is a great toy car unit with an exceptional truck capacity. As it is important to store cars the right way, it will be a perfect gift for every Hot Wheels toy car collector. 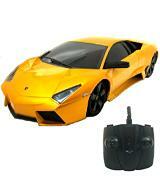 20" x 3.5" x 5"
The remote control of this Lamborghini toy car has two levers that provide easy and convenient control. The suspension is low, so it works best only on flat smooth surfaces. This Lamborghini toy car with a remote control combines toy car functionality and an exceptionally realistic look of a Lamborghini Reventon. A complete replica of a real supercar plus some great performance for a toy. And all this at a reasonable price! 10" x 4.5" x 2.5"
Pour some water over this Disney car toy and it will change color! Fascinating, isn't it? It will help your child develop color perception. The water containers are a bit small for a whole car. You will never find a better present for a kid who is a Disney's "Cars" fan. 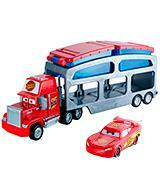 Let your child get all the fun with Mack Transporter and Lightning McQueen, it will be unforgettable. 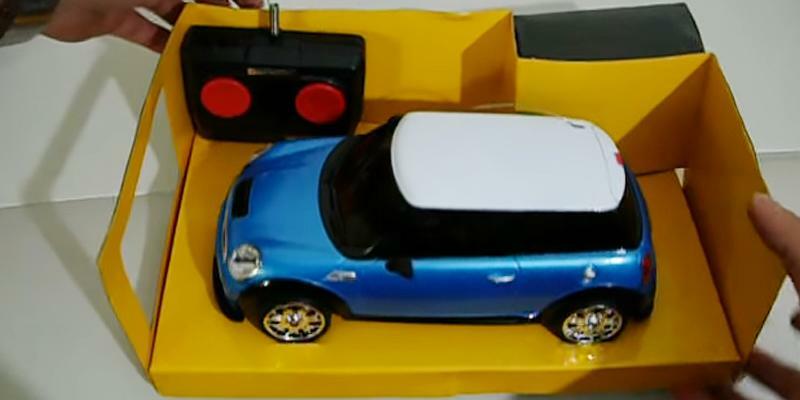 12" x 2.4" x 7.5"
Openable doors of this Mini Cooper toy car will allow you to see the interior which is a wonderfully detailed replica of a full-sized car. Only doors can be opened, trunk and hood can not. 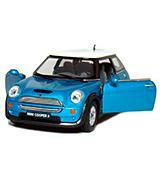 This Mini Cooper S toy car will be a great present for a child as well as for the owner of a real Mini! There is definitely a place for this one in your collection! 5.4" x 2.8" x 2.7"
If this Hosim toy car with a remote was a full-size vehicle, it could be a part of Mad Max: Fury Road movie. It conquers cross-country as easy as it rides flat city roads. No obstacles can stop it from rearing forward at a blast speed. The body is made of high-quality plastic, and big wheels have rubber tires to provide good road-holding whatever surface you ride on. The front and rear bumpers protect this toy car in case of hitting something, not mentioning they also add to the bold look. And to complete the said look, there are stylish captions on the housing. This thing is mind-blowing! 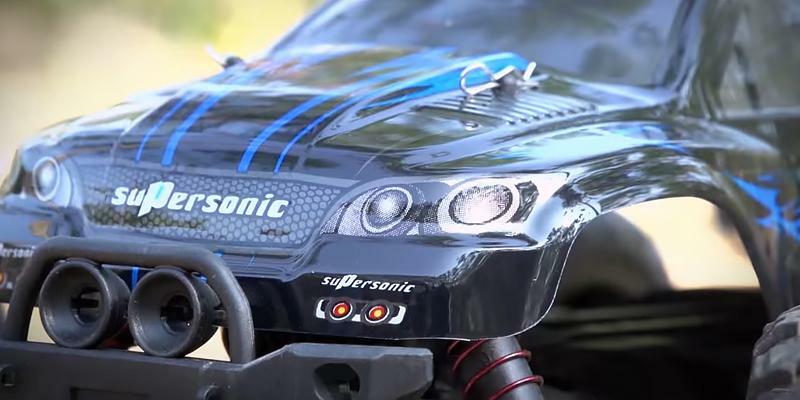 Hosim 1:12 Scale Electric RC Car operates using a powerful GP Brush 390 motor. With its two-wheel drive, this electric car toy can speed up over 33 MPH! The 2.4 Ghz Radio system powered by two AA batteries (not included) will make controlling this car toy as easy as it can be. You can send the car up to 328 feet away and it will still obey the remote commands! 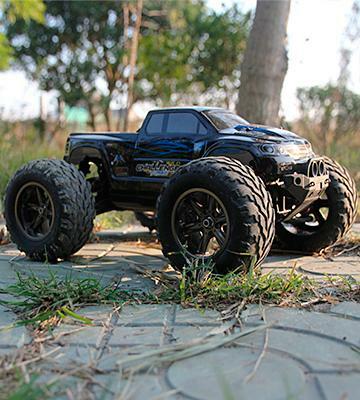 Hosim manufactured this toy car using S-Truck suspension technology so that it is stable on any surface. In the box, you will also find a Li-ion 7.4V 800mAh battery and a charger. The manufacturer claims this electric car toy is intended for childer older than 14, but we all know that kids grow up fast these days. 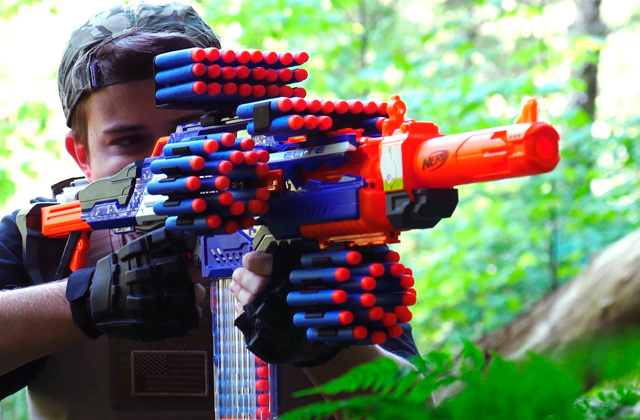 We think your 10-year old will be thrilled to receive such a toy. And, for those adults who are still young at heart, this will be a wonderful present as well! 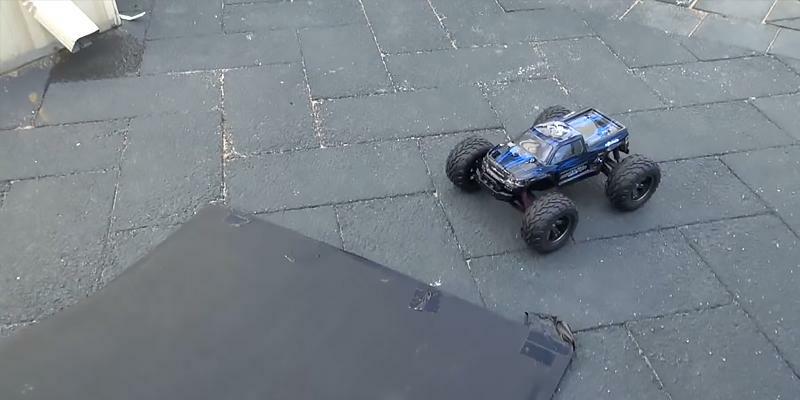 The Hosim toy car with a remote control is a 1:12 car, and it is really good at passing corners. The size is 12.6" x 10.2" x 5.5", and the weight is 3.9 pounds. 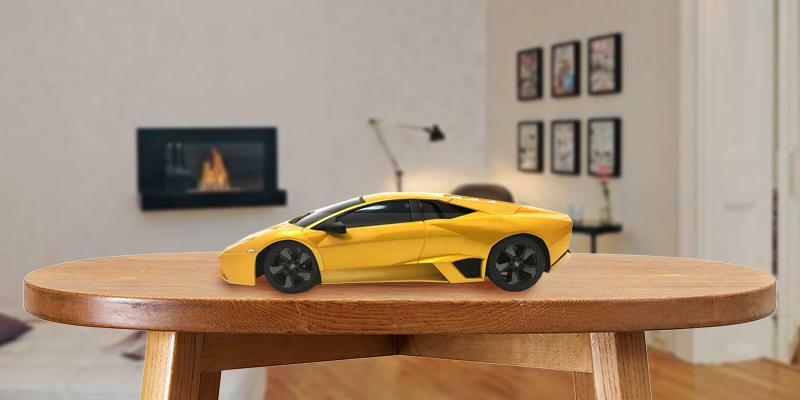 With its every parameter, this toy car hints at an excellent quality! 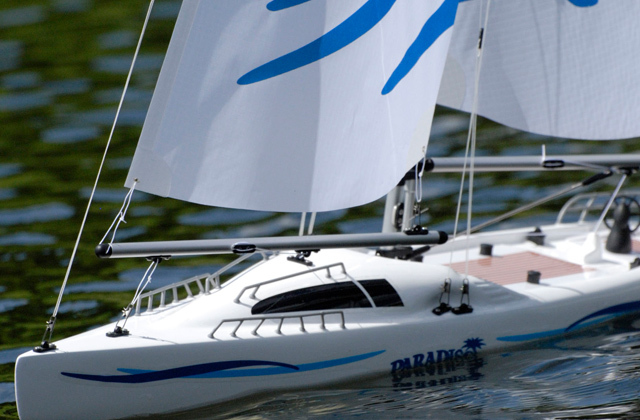 You or your children will have an opportunity to pull your inner racer and take part in competitions. And, what is also important, win them! The Hosim toy car is a whole ocean of positive emotions! Hot Wheels is a company known worldwide for its toy cars collections. Here, they introduce a whole mini auto fleet! With a single buy, you get a truck and 3 light motor vehicles that can be hidden inside the truck. For this very reason, the plastic truck has a trailer. 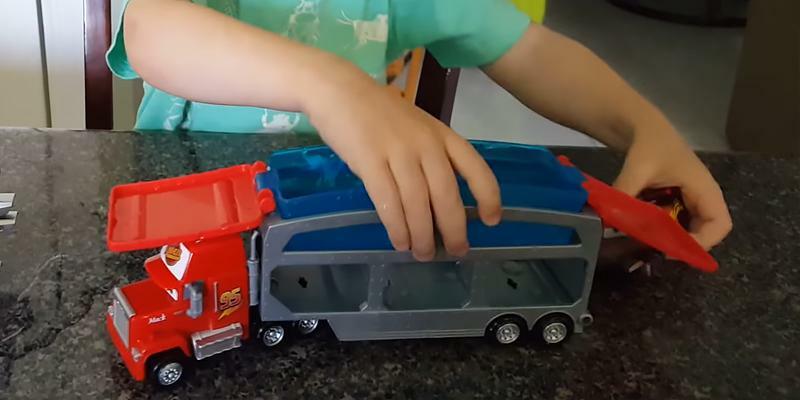 Furthermore, children can fit more than just 3 cars into the trailer, it is designed to contain up to 14 Hot Wheels vehicles. That's quite a good start! Your kid will have a chance to play with friends, find some new ones, get a lot of fun and enhance communicative skills. Although the light vehicles are mechanical, your kids can entertain themselves by "shooting" cars from the truck. Load them into the trailer first, pull the trigger, and release it! The children will be stunned by how fast and far their toy cars will go. This is all achieved thanks to the built-in kid-powered launcher. Otherwise, all the vehicles in the set are simply driven around the room by your children's hands. The truck is 20" x 3.5" x 5" in size and 1.1 lbs in weight. Hot Wheels vehicles boast 1:64 scale. The latter dimension means that these cars are quite tiny, therefore they aren't recommended for use of the kids younger than 3 years old. Toddlers tend to take various things into their mouths, thus such small cars can easily be swallowed. At the same time, kids over 3 are often old enough to fully enjoy this kind of game. They will happily try themselves both as racers and as truck drivers. There is a chance that you yourself will play with this electric car toy more than your kid. If you love car races and dream about a supercar, that is. But we hope your child will not suffer from this! Anyway, this toy car with a remote control is a replica of 2007's limited Lamborghini Reventón. The number of cars produced was really small, only 20 (20 to be sold and 1 for the Museo Lamborghini). The toy car replicates the original in the smallest details, and its rims and tires have a glossy finish topcoat. With this toy car, your kid will feel like a real racer! The two-wheeled drive electrically powered provides up to 8 MPH speed and the remote control acts without any lags at the 30-feet distance. Yes, you can play with this toy car not only inside your house but outdoors, too! The remote control allows covering all directions, go forward, reverse, left, and right. 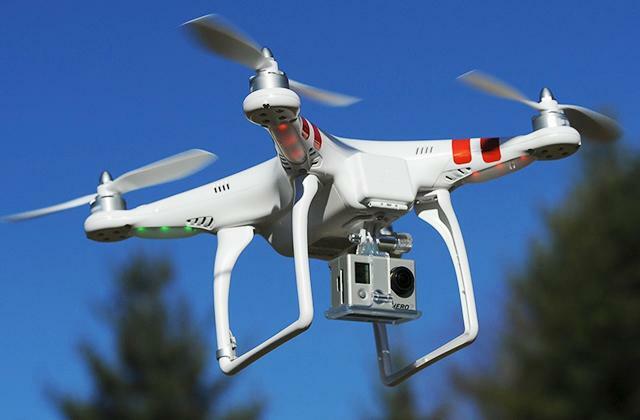 You will only need to buy 4 AA batteries and one 9V battery. The tires are high-quality, you will pass corners just fine without losing the road-holding. However, note that the suspension here is rather low. To avoid damaging this toy car, please use it on flat surfaces only. 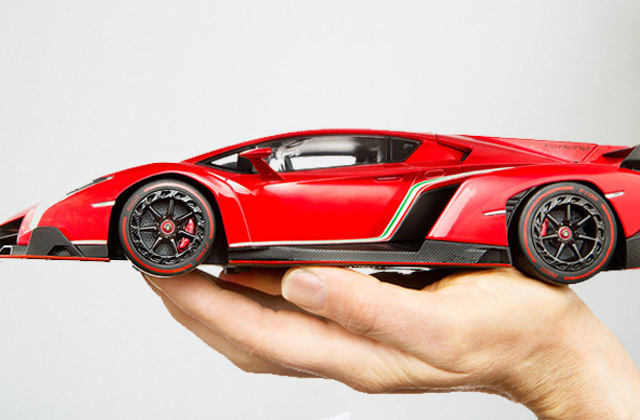 The size of this electric car toy is 10" x 4.5" x 2.5", and it is 18 times smaller than the original Lamborghini Reventón. 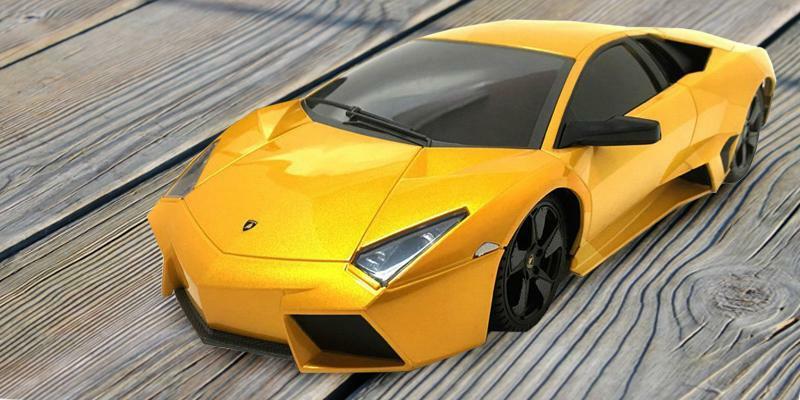 The weight is 1.4 lbs, so the Lamborghini toy car will not spin at the corners. The size and weight are the only things that are different between the two. Buy this toy car for your children and they will be elated. Never before was there a supercar this affordable. 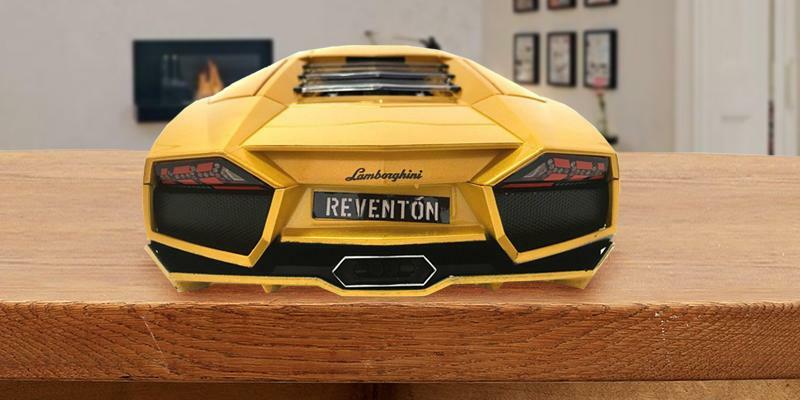 For the small parts not to be swallowed, we recommend you not to give this Lamborghini toy car to children under 3 years old. It's hard to find a person who didn't like cartoons in their childhood. Many love cartoons for their whole life, despite the age. Today, the most famous cartoons are probably those created by Disney/Pixar: Toy Story, Finding Nemo, Monsters, Inc., Cars, and many more. As we are now talking about toy cars, the Cars movie is obviously the first choice. 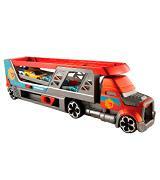 This set of Disney car toys includes a Mack Transporter vehicle which trailer has two levels. 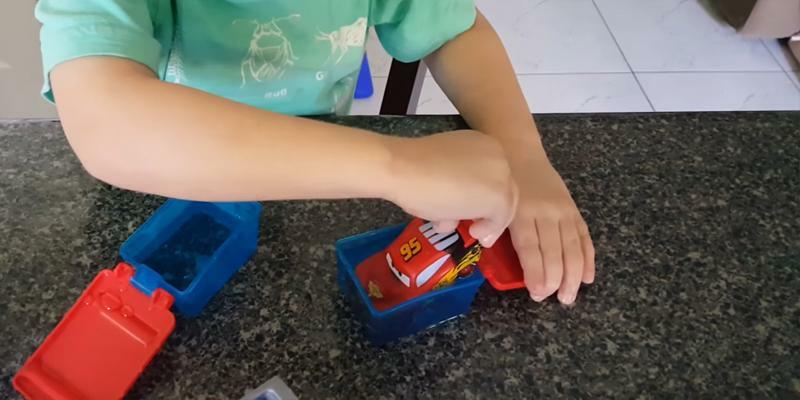 The first level is for storing a Lightning McQueen car, and the second is for two water tanks, one for cold water and the other for warm (all included). The material is eco-friendly plastic, so no harmful emissions! The cars in this Disney car toys set are mechanical, safe and reliable. They will entertain your kids for years. Lightning McQueen can change colors! Dunk it into the cold water tank to change its color from red to black and then into the warm water to change the color back! Really entertaining. 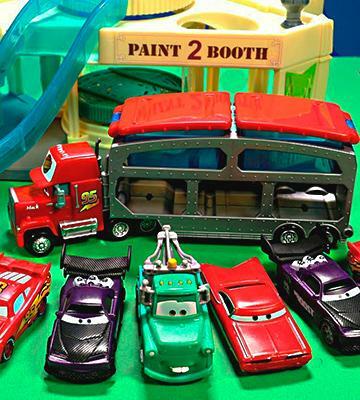 The trailer can transport other Disney car toys that are sold separately. Also, you can disconnect the trailer from the Mack Transporter, then open or close the back door for storing smaller cars there. Buy this wonderful set for a 4+ year child. This is mostly the age when kids start imitating the scenes from cartoons. At the same time, after 4 years they do not try to put the tiny parts into their mouths, and these Disney car toys have them, so be careful. 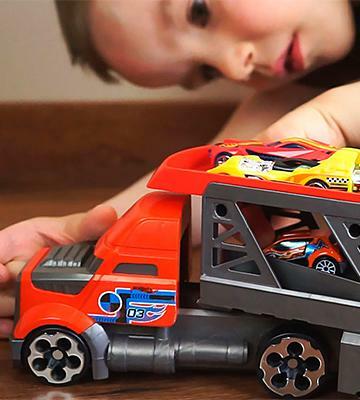 Furthermore, fun is not the only thing your kids will get with these toy cars. Owing to the changeable color, your kid will learn to differentiate colors and will remember their names. So, in addition to entertaining, it is also a very developing toy! Two-in-one. The Lightning McQueen is 1:55 in scale, and the size of Mack Transporter is 12" x 2.4" x 7.5". The total weight of these high-quality cars with the tanks is 2.2 lbs. 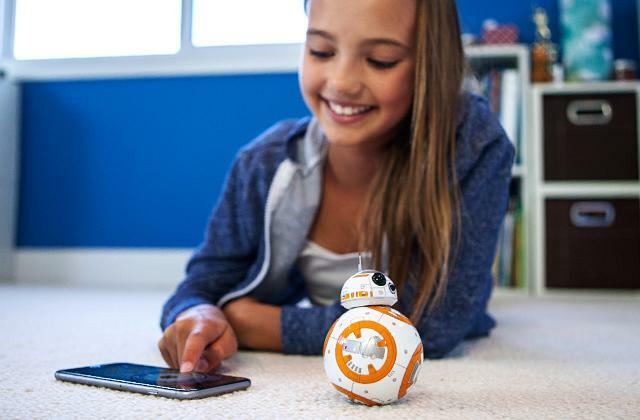 Get the kids' favorite characters from the screen into reality. Mini Cooper S is a popular light vehicle in real life, it has gathered millions of fans all over the world. Mostly, owing to its beautiful exterior. 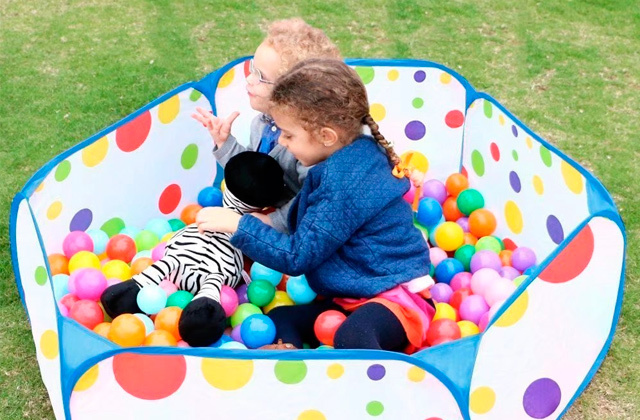 Its popularity is what has led Kinsmart to create its miniature toy copy. This toy car looks just like the real one! 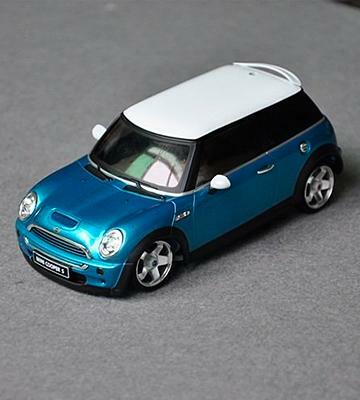 The metal casing makes this Mini Cooper toy car very reliable and adds to its similarity with the original car, the plastic decor elements enhance the design. Beside being a wonderful toy, this Kinsmart Mini Cooper S toy car will be a great addition to your collection or a gift for your friend who owns (or doesn't) a full-size Mini. 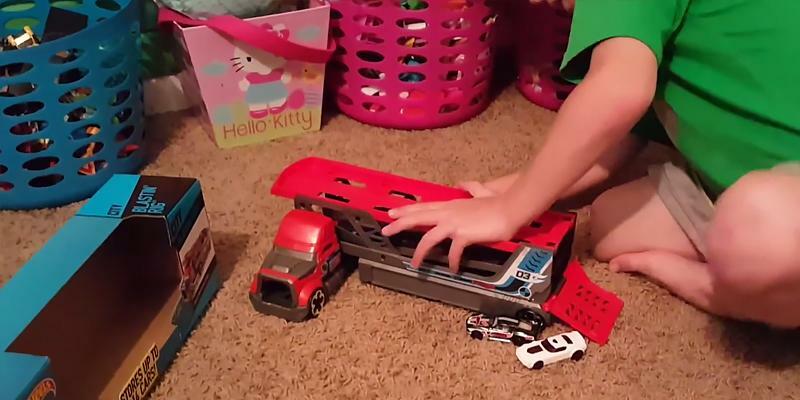 This Mini Cooper toy car moves thanks to a pull-back action mechanism. You can either drive it forward with your hands or pull it back to activate the spring-loaded mechanism and then release the car. It will go forward for some distance without pushing. It's pretty engaging. Also, the inertia mechanism has a distinct sound that will keep your kid amused. 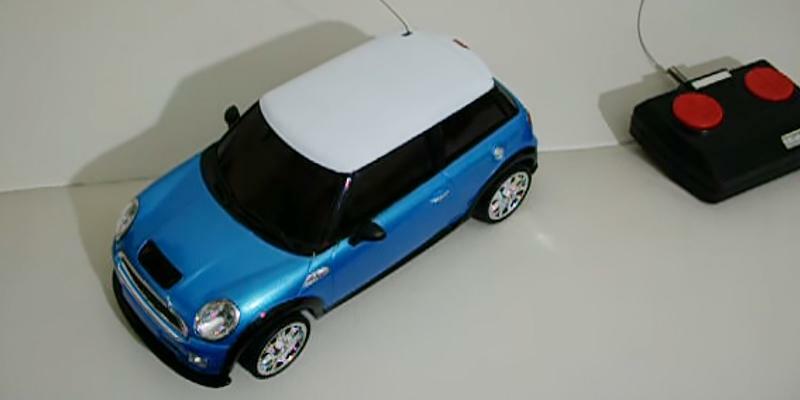 The interior design of this Mini Cooper toy car is very detailed and you can see it all. Even the dashboard looks convincing! 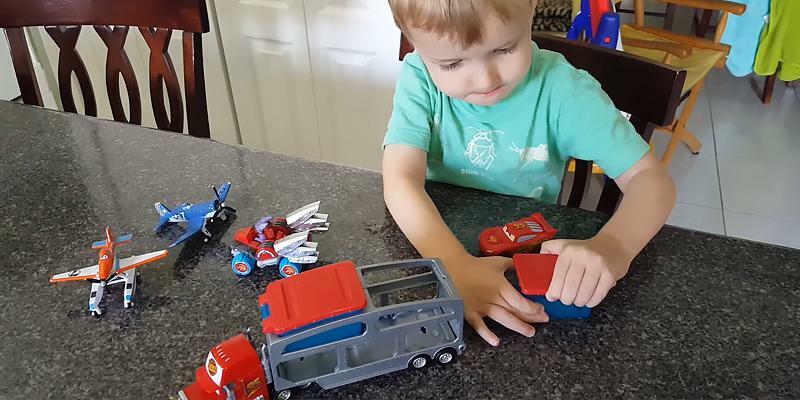 Not like it never happens, but it's pretty uncommon for very small kids to be interested in collectible toy cars based on real cars. That is why the recommended age the manufacturer established for this Mini Cooper toy car is 8+ years. The toy car scale is 1:28, and the dimensions are 5.4" x 2.8" x 2.7". It is big enough for you and your kid to see the glorious exterior and interior that look just like those of original Mini Cooper S. It weighs 0.25 pounds. Whether you are going to let your kid play with this toy car model or it is an addition to your collection, it's still a great choice! When children get a bit older, every parent starts to wonder what toys to buy so that they are engaging, fun, developing, and yet safe. One of the best decisions, if you ask us, is a toy car. Your kid will be able to play with toy cars in a house and outside alike. Let the children replay plots from their favorite cartoons and computer games, or just buy a toy car to be used as an accessory for a doll. Today, toy cars can be complete replicas of real cars in exterior and interior, only in miniature. Let your child discover the world through car's mechanics, it will develop a logical thinking. And playing with other kids in a park will enhance communicative skills. Plus, it is simply a lot of fun. Or you can choose a toy car that looks like some vehicle from your kid's most liked cartoon. Whatever your choice is, we are sure that your kid will be on cloud nine with joy. If you are looking for other toys too, we can suggest you going through dollhouses and toy robots. Those will not only entertain your children but also teach them various things. No matter how many options a toy car features, it is pointless if your child does not like it, right? So, first thing in the process of selecting the toy, ask your kids what Design of a car they would like. Maybe your children dream of Pirelli World Challenge, Formula, or Trans-Am Series! Buy them a mini supercar and they will be overjoyed. Or what about a career that brings help to people, like firefighters, doctors, police officers? They all have their cars, too. And, of course, the manufacturers of toy cars did not overlook this. Children can imitate situations they see on TV — extinguish fire, catch criminals, or rush to a medical help in an ambulance toy car. Nowadays you can find all types of cars in miniature, from your regular sedan to a large truck or a bus. And there are even some sets with different types of cars, with which your children will play out an unlimited number of situations. The famous Willy Wonka had a song about it, remember? Sing with us: "There is no life I know to compare with pure imagination...". Wonderful, isn't it? Ah, well. Let's continue. There is also a Material to consider, of course. You will have a selection of plastic, metal, wooden, and rubber toy cars. Or maybe you will encounter something extreme and rare. Plastic is the most popular material today, and the most widespread, of course. This has led to a great selection of shapes, colors, sizes of toy cars. 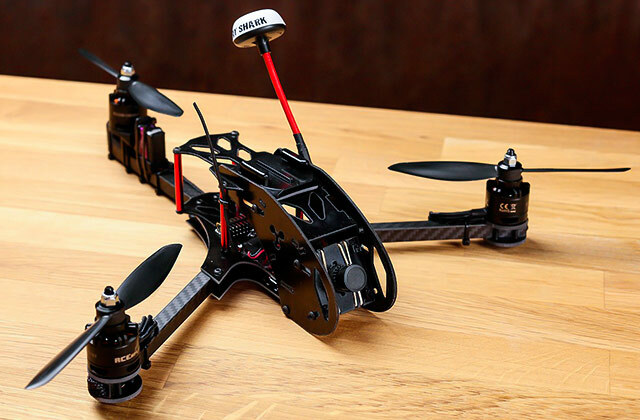 Among the upsides here — a really affordable price and light weight. Downsides? Durability, apparently. Then there are metal toy cars, the most real-looking and durable. Collectible models are made of metal. They are often heavier and more expensive but under otherwise equal conditions they last longer. Next, look at the Operation Type. Toy cars can be mechanical, inertia, and electric. The former are the least expensive and the simplest as they do not need complex mechanisms and operate by the force your kid applies. Inertia toy cars can be started either by the key or a pull-back action; they can go on their own for some distance. Electronic toy cars are the most complex, they have batteries and are often controlled via a remote control. This type can have two- or four-wheel drive, 2WD and 4WD respectively. 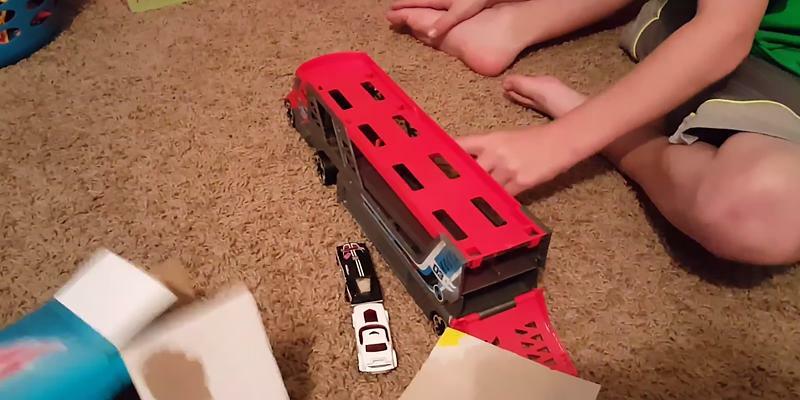 These are the most functional toy cars, they can reach quite a noticeable speed. No need to mention that they often capture the attention of not only children but adults, too. Some toy cars (of any type) have openable doors/hood/trunk for additional realism, and you can often load smaller vehicles in mini trucks. Create a whole vehicle fleet for your children! 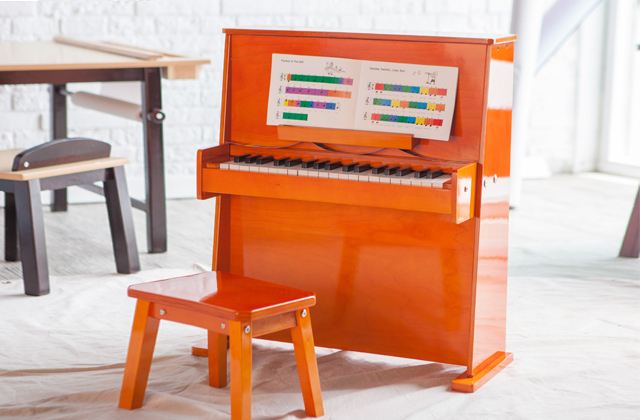 Additional sound and light effects will trigger your kid's imagination. 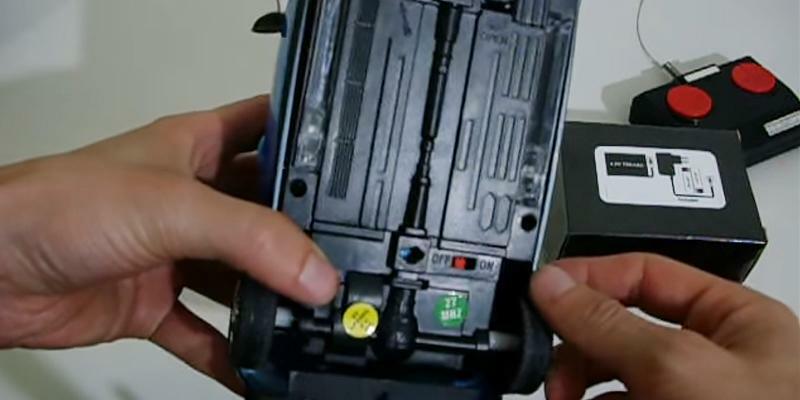 If a toy car has a remote control, you should pay attention to its operation range and the rechargeable battery availability. Professional-level toy cars can feature rubber tires for better road grip and a suspension that looks just like a real one. The 4WD toy cars are mostly like this. They will be interesting for adults as well as for kids. 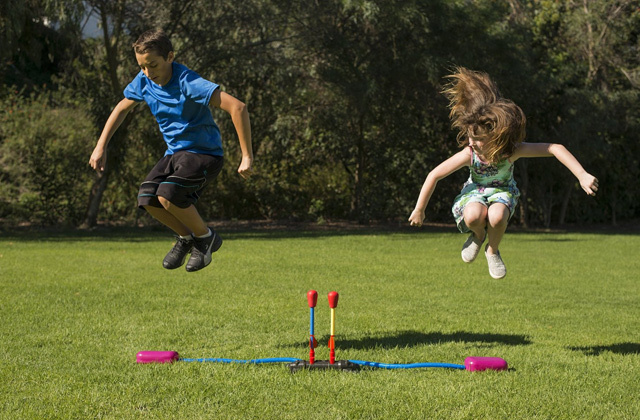 Enjoy the adrenaline rush together with your kid racing your neighborhood rivals! When it comes to toys' safety for a kid, the need arises to check the Age they are intended for. Children of up to 3 years old are better to be given soft rubber noisemaker toy cars of bright colors. Or those of a one-piece design that can sing songs. They will attract your kid's attention and help enhance various skills. When the child turns 3, it is time to buy car toys designed after famous cartoons. The children will use their imagination. 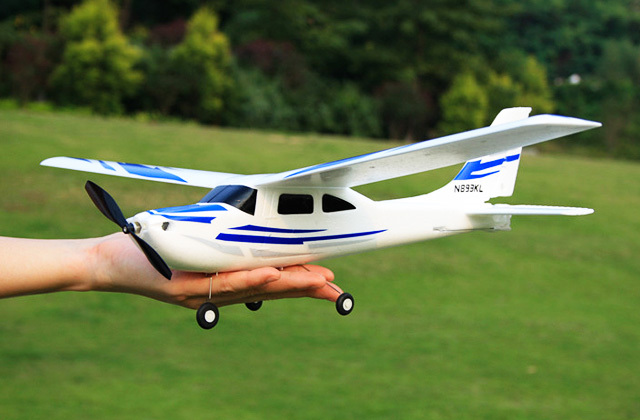 Some simple electric models with remote controls will also do good. Then, once the 7-year barrier is overcome, the children might get into collecting toy cars and creating a fleet. 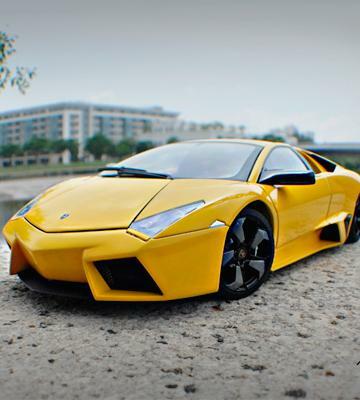 For kids over 10, the best choice will be remotely controlled mini models of real supercars. 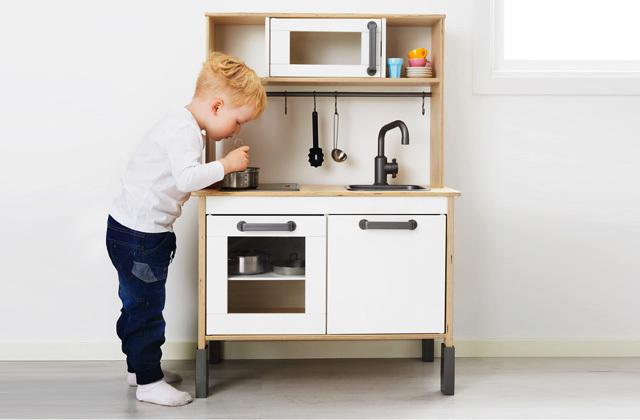 They are able to speed up and boast a lot of tiny parts, and your child will be able to play with them even outdoors. On the box or in the description, you will probably see the "Scale" field. This is the ratio between the model's size and the real car's size. Together with the size and the weight, it is an important parameter. Toddlers are better left off with lightweight toy cars with no small parts as they can swallow those. And the toy cars with remote controls are affected by the weight when it comes to the maneuverability and stability. Buying the proper toy car for your child's age will end up in a load of happiness. 1. 12 Tips for Collecting Diecast Cars, eBay. March 3, 2016. 2. HOW TO CHOOSE THE RIGHT TOYS FOR YOUR CHILD, My Learning Baby. November 3, 2015.